Designer Yuna Yang has stated that as a female Asian designer, she constantly faces challenges of breaking the stereotype of ‘an Asian woman’. One of her reasons behind her brand is to have a world where people are free to achieve their dreams by facing challenges with passion and ceaseless efforts regardless of their background. 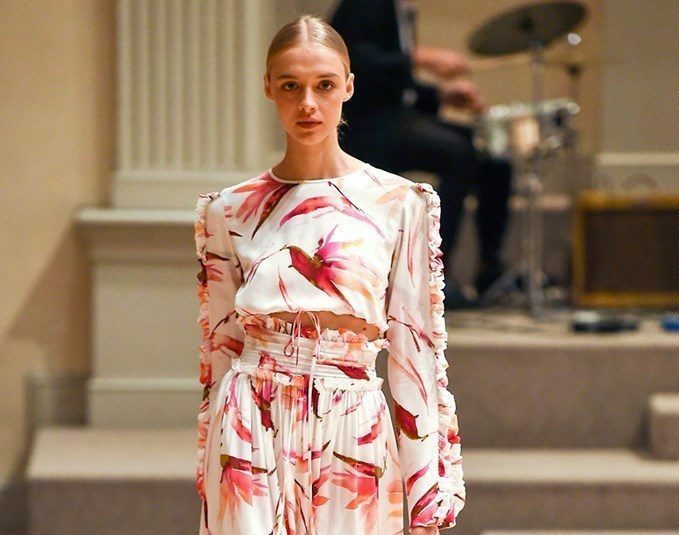 Her Spring/Summer 2019 collection was about freedom. To be able to have the freedom to be who they are, to love who they love, and to wear what they would love to wear without any judgement. This takes shape in a collection filled with pieces that represent who Yuna Yang is at this current moment. The collection represents strong, assertive silhouettes contrasted with the ruffles and lace emblematic of fragility, and femininity. This season an undercurrent of sensuality runs throughout the collection. Bare shoulders, sheer fabrics, a slice of skin at the waist that broadcast the confidence of a woman who knows herself and is not afraid to take up space. With this very personal collection, various elements reference the time Yuna spent in three continents. Her most recent years were spent in New York. While in New York, she was inspired by variations on the classic shirtdress and silhouettes that expose the shoulders. Full sleeves and corsetry recall old European romance.